Lead Us to Repentance, a Lenten video. Christine Sine’s written meditations and the music of Jeff Johnson combine with powerful visual images for a powerful experience focusing on our brokenness and need for repentance and restoration. Click on the title above to download from Mustard Seed Associates or to access a low-resolution YouTube version. 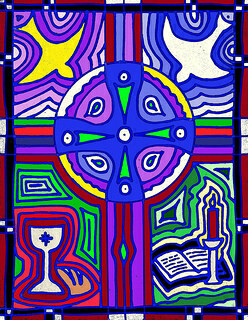 Arts and Faith: Lent. For each week of Lent you’ll find video commentary about a work of art inspired by the Sunday scriptures. Use these videos to take a new look at this season of spiritual renewal through the lens of sacred art. Commentary is by Daniella Zsupan-Jerome, assistant professor of liturgy, catechesis, and evangelization at Loyola University New Orleans. The Lent Project. Created by the Center for Christianity, Culture and the Arts at Biola University, this online resource provides a striking image and a meditation for every day of the 40 days of Lent. The bad news: It was created for another year, so the 40 days don’t match the current calendar and the meditations are not intended to follow the lectionary. The good news: the themes are universal, and the combination of visual arts and reflection is quite meaningful. To enjoy, click on “show full calendar” at the bottom of the home page. Lent Devotions: Lent Begins at 40 and Lent Devotions: A 40 Journey of Renewal, by John Stuart. John Stuart is a Scottish Presbyterian pastor ministering in East Tennessee. He’s also a wonderful artist whose works have graced our publications and website. These two Kindle e-books feature both his art and his writing and are available for a very low price at amazon.com. Read them on a color reader if possible! To see more of the author’s art visit www.stushieart.com.